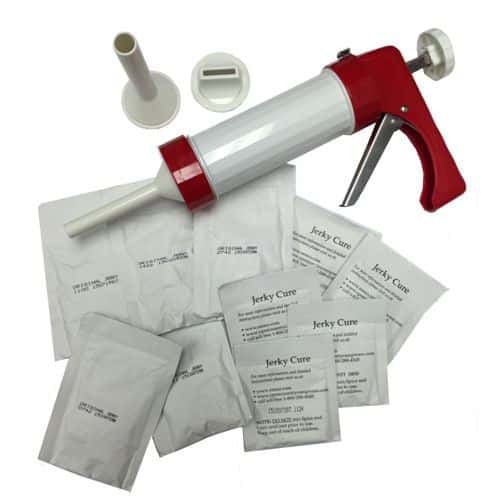 Jerky gun includes 3 attachments: a flat tip for making jerky strips and 2 round tips for making large and small jerky sticks. Includes 5 jerky spices and cures, enough to flavor 5 pounds of meat for making jerky. Simple and easy to use. Fun for the whole family…the kids love it! The famous Nesco/American Harvest® Jerky Works™ Kit. Everything you need to start making great tasting beef jerky in your home. You can make perfect jerky sticks and strips, with ease every time, using the Jerky Works! Comes with a variety of our jerky seasoning packs…other flavors that are available include Original, Hot ‘n Spicy, Teriyaki, Pepperoni, Fajita, Cajun, Andouille, and Cracked Pepper & Garlic. Great for making jerky the way you like it and at a fraction of the cost. Make great tasting Beef Jerky, Turkey, or Venison Jerky at Home. It’s FUN and Easy. I recently upgraded from my good FD-60 to an FD-80. I’d never tried jerky in the FD-60, even though I like it. I thought it would just be too much trouble. What I didn’t understand was that jerky could be made from hamburger meat! I thought it had to be some two or three day process and a lot of trouble. Wrong-I ordered the kit and within a few minutes I was squeezing out jerky onto trays! 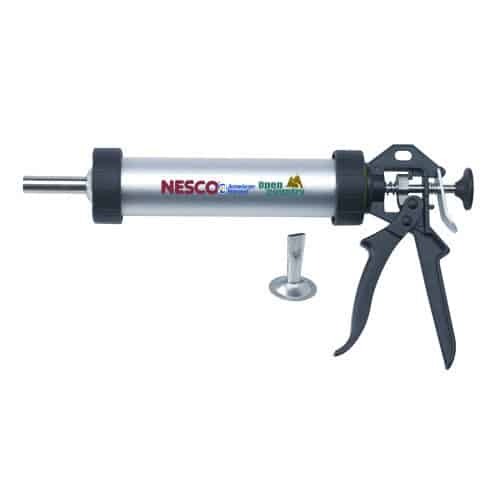 Anyone who’s ever made molded cookies would recognize this jerky gun as a heavy-duty version of the cookie press. I started with the round nozzle but quickly gravitated to the wide/flat one. After a few hours it was done to perfection. I served it to some guests coming over and they thought it was fantastic. I know this will become a staple for me. And yes, the hot/spicy mix was the favorite for my and my crowd. I bought this jerky kit to just try something new. I like to try new things out. And let me tell you it is an amazing little kit. The jerky is really easy to make you just mix it put it in the gun and bam your on your way to some of the best jerky you’ve ever had! I highly recommend this product to anyone who loves jerky!! !